Ichiro Suzuki has officially retired from baseball effective immediately. 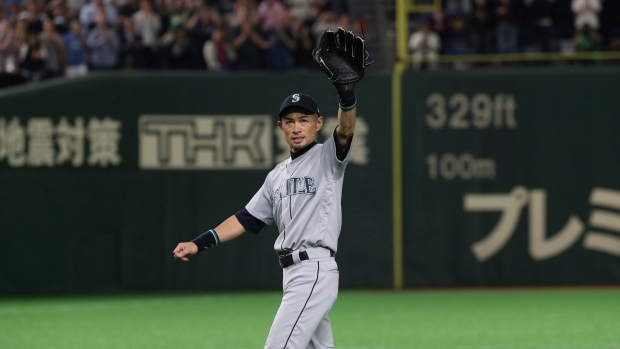 The legendary Seattle Mariners outfielder made the announcement following Game 2 of MLB's Japan Opening Series in Tokyo. "I have achieved so many of my dreams in baseball,” Ichiro said in a statement, “both in my career in Japan and, since 2001, in Major League Baseball. I am honored to end my big league career where it started, with Seattle, and think it is fitting that my last games as a professional were played in my home country of Japan." The 45-year-old Ichiro retires as baseball's active hits leader with 3,089. A native of Nichi Kasugai-gun, Japan, Ichiro joined the Mariners in 2001 following a nine-year career in the NPB with the Orix BlueWave. In the NBL, Ichiro was a seven-time All-Star, winning three MVPs and won the Japan Series in 1996. Ichiro immediately became a sensation in North America, taking the MLB by storm winning the American League Rookie of the Year and Most Valuable Player Award in 2001, batting .350 with a league-leading 242 hits, eight home runs, 69 runs batted in and a .836 OPS. Ichiro spent 11 seasons with the Mariners before being dealt at the 2012 deadline to the New York Yankees. In 2013, Ichiro recorded his 4,000th hit (MLB and Japan combined), joining Pete Rose and Ty Cobb as only the third player to achieve the feat at the highest professional level. In 2016, he recorded his 4,257th hit, breaking Rose's all-time mark as a member of the Miami Marlins with whom he spent three seasons from 2015 to 2017. “I want to thank not only the Mariners, but the Yankees and Marlins, for the opportunity to play in MLB, and I want to thank the fans in both the U.S. and Japan for all the support they have always given me," Suzuki said. He returned to the Mariners in 2018. Ichiro finishes his career with an all-time mark of .311, 117 HR, 780 RBI, 509 stolen bases and an OPS of .757.